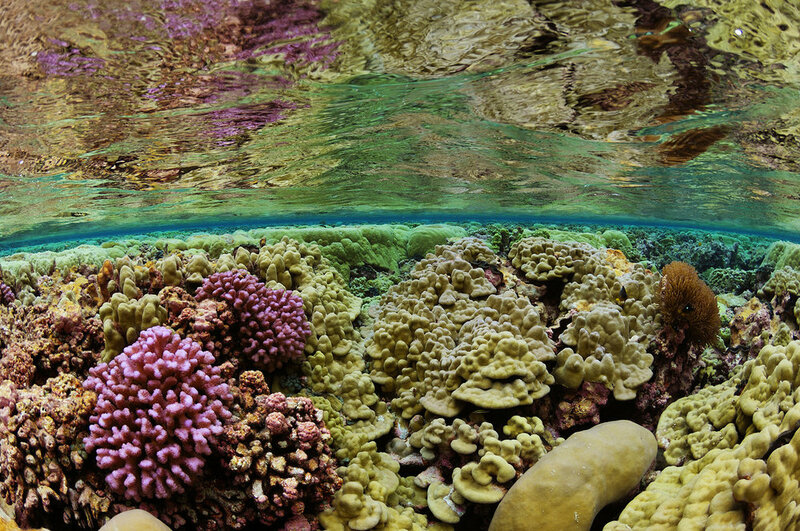 Located in the central South Pacific Ocean, Kingman Reef remains largely unspoiled with healthy and abundant corals. Exploring its remote location is like traveling back in time. A tiny blenny emerges from its home within hard coral to feed on nutrients from the sea. In the temperate waters of Suruga Bay, Japan, a tiny goby mimics the soft coral on which it lives. 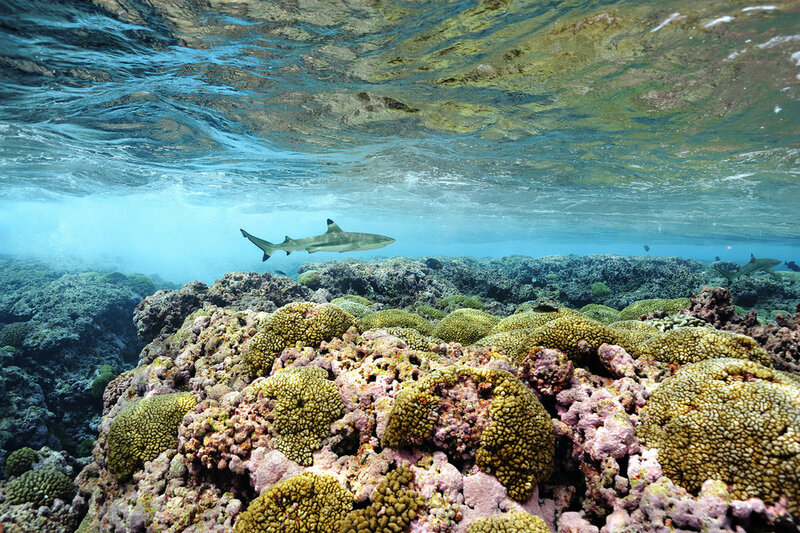 A blacktip reef shark patrols the surf zone on this pristine reef. A tiny shrimp, about one-half the size of a grain of rice, lives on a colorful anemone. Using a bit of motion camera technique reveals a nearly 3D view of this stunning urchin. 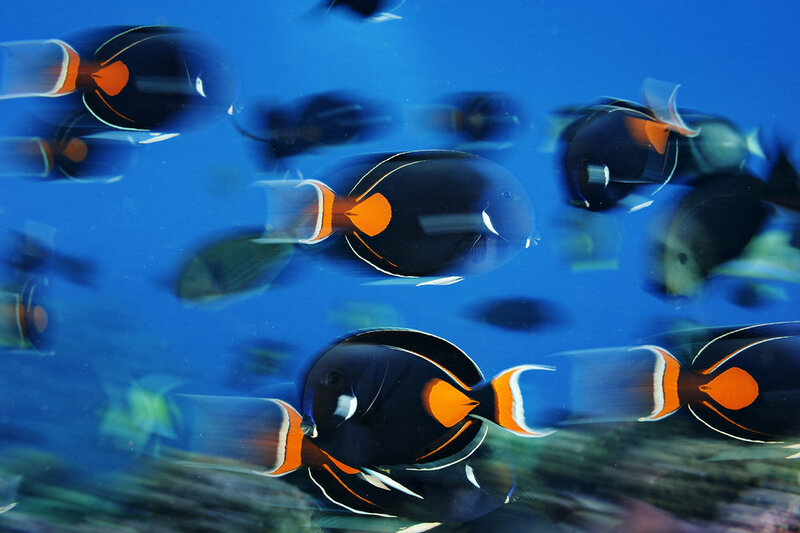 A school of Achilles Tang fish feed in shallow water on plankton from a deep-water burst of nutrients. Just before sunset, this pair of goatfish swirled within the corals, engaging in a spawning ritual. 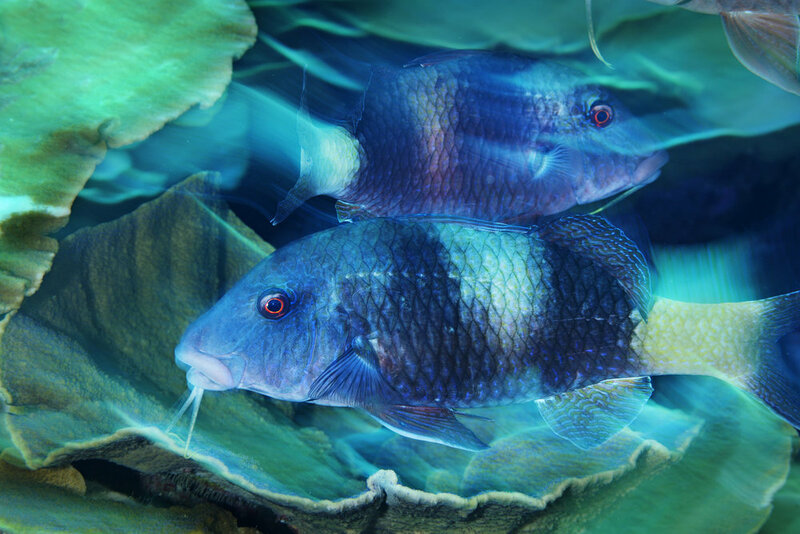 Moments after this photograph was made, they rose upwards towards surface waters to spawn, disappearing into the darkness. In the lagoon at Kingman Reef, giant clams line the sea floor, their electric-colored mantles glowing as they filter the water, keeping the habitat clean and healthy. A gray reef shark hunts near sunset on this healthy reef. Predators play a key role in the health of coral reefs. In this extraordinary exhibit, Brian Skerry provides unprecedented access to life in and around the worlds' coral reefs. Whether it is in the shallow water of Kingman Reef or the grandeur of Millennium Atoll, Brian has spent his entire life exploring and illustrating the vitality of life in the ocean. Colorful images of the reefs and the species who live there draw in the observer, demonstrating both the diversity and the fragility of life in the soul of the sea. I was seduced by the ocean's siren song at a very young age and wanted to explore beneath the waves. After becoming a diver, I discovered photography and had an epiphany -- I would explore the ocean with a camera. Being a visual storyteller about the undersea realms was a passion I could not ignore. Over time, I began to see problems in the oceans -- issues that others did not see. My work today is a combination of celebratory work and reportage. I create images that help people fall in love with the sea, while also shining a light on the problems and the potential solutions. For Coral Crucible, our Impact Partners are working in the water and in the laboratory (and together) to plant and sustain newly-planted coral around the world. Learn more about our Impact Partners.